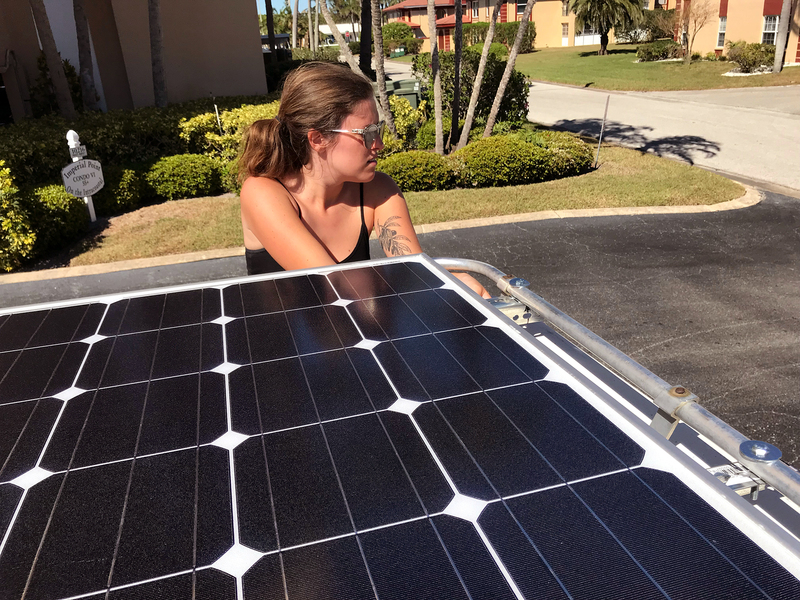 While taking a mini vacation from driving in Largo, Florida, we invested in some serious upgrades for Clementine: a new starter and a full solar system. We also hit up Siesta Key and drank from the Fountain of Youth in St. Augustine. Will confirm the effectiveness in 10 years time. 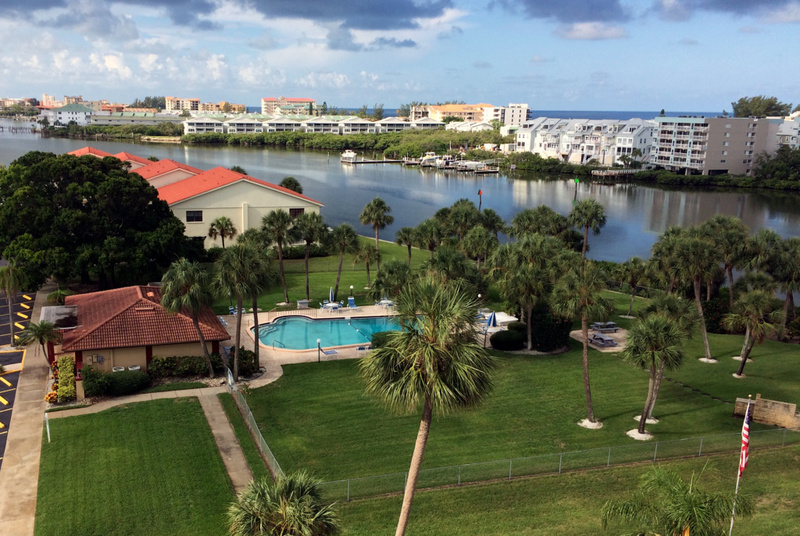 Our mission now was to reach Largo, just a short drive from St. Petersburg, to recharge a bit at Justin’s parents’ snowbird condo. One thing we’ve learned along the way is that we seem to get along quite well with retired people – they’re finally doing what they want to do after years of slaving away at work and we’re also doing what we want to do, just without being retired. 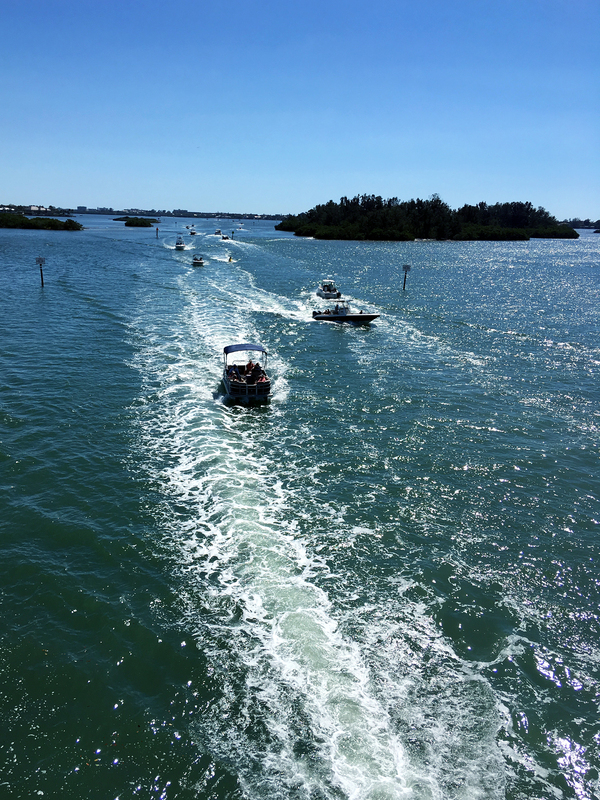 Now that we had reached the Gulf side of Florida, we had some time to kill one afternoon and decided to see what Siesta Key was all about. A word to the wise, don’t bother going at mid-day and expect to find a parking spot. In true Florida February fashion, the place was PACKED. I still have to keep reminding myself that this is high season here – actually, the congested roads and closed off parking lots do a pretty good job at it. We’ve got snowbirds, vacationing families and partying spring breakers all being sucked in by the Florida sunshine’s magnetism. Us included, of course. Anyway, after observing “America’s #1 Beach” from the windows of the van, we stopped alongside a drawbridge to make some lunch and enjoy the seaside views. In this case, that meant big yachts and even bigger mansions. This side of town was a little calmer and was lined with happy families spending the afternoon collecting cast nets full of fish. 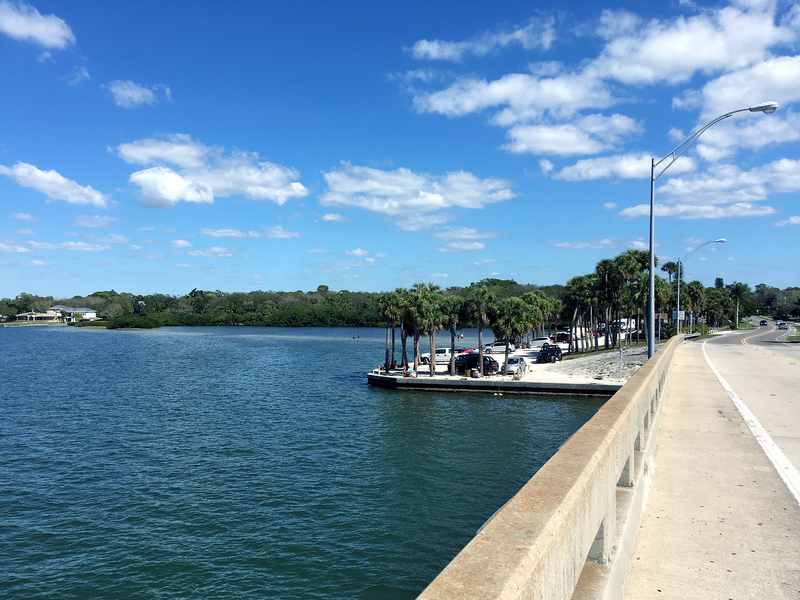 There’s a park area on either side of the bridge and I’ve heard of people boondocking on the western side in Nora Patterson Park – a good spot to keep in mind if you’re ever in the Sarasota area. When we were ready to go, surprise surprise, the van wouldn’t start. We did our tried and true “wait it out” method and she still wasn’t turning over, even a half hour later. As always, we met lots of friendly people while waiting who helped distract us and offered tips for places to check out all over the country. There definitely is a silver lining to our constant starting struggles since whenever we’re in a parking lot with the hood up, some wonderful humans come by to try and help or just chat. We’ve been blown away by the responsiveness and hospitality of some of the folks we’ve met and for that, will be forever grateful. In this case, we were exceptionally grateful when Clementine finally fired up about an hour later. We spent the night at the Green Swamp Wilderness Preserve and finally enjoyed some quiet, secluded “wild camping” in Florida. 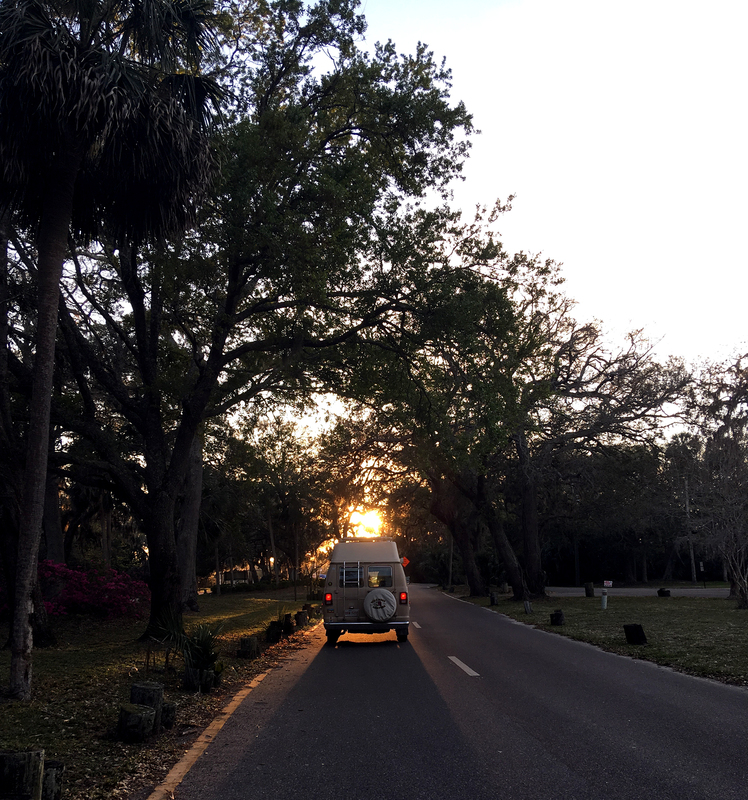 Similar to the DuPuis WMA we visited a couple weeks prior, you can make a free reservation on the Florida Water Management website and small campers like ours can use the equestrian designated campsites or any other non-backcountry primitive camping zones for up to 7 days. 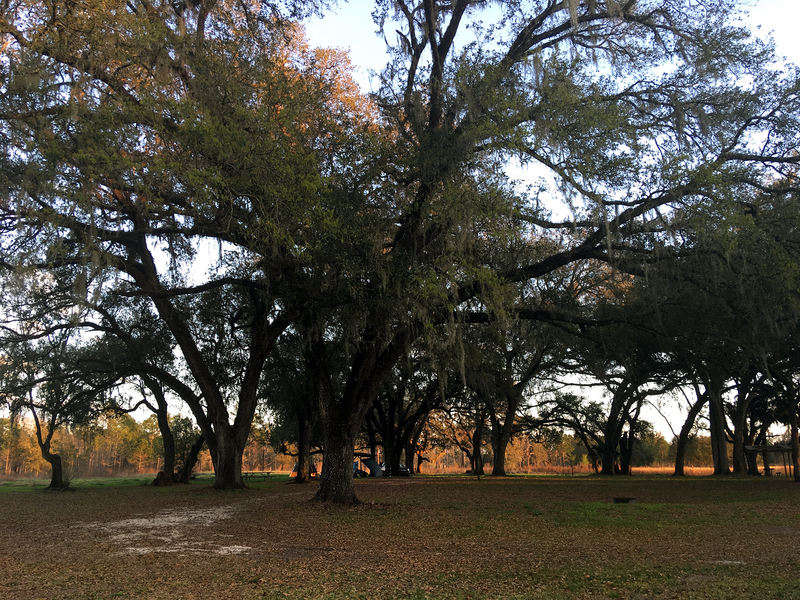 We stayed at the Ashley campground on Green Swamp’s West Tract mainly because it was one of the only ones not full or not closed for a hunt. Even though these WMAs are similar to BLMs, they require a lot more planning which makes me miss the west coast. In any case, this is a great spot with picnic tables, fire rings and even orange trees scattered around. Sadly all of the edible looking oranges were out of reach but I’m sure they’d be tasty if you had a ladder. And good enough balance that you wouldn’t fall off of it with the gazillion bugs flying around. Arriving at the condo meant having air conditioning, wifi & TV and showering every day just because we could. As much as we love our little home on wheels, we can’t deny that the modern conveniences of a house are quite nice. We also realize that we’ve come to appreciate these little things a lot more – before, we thought it was just “normal” to have a flushing toilet and running water, pft what snobs! Because we’d be staying in one spot for two weeks, we were able to save on all of our expenses that weren’t food so we thought it would be a good time to take the plunge and invest in a solar system. We already had a deep cycle marine battery that our DC appliances ran off of (fridge, lights, etc.) that was just getting its charge from the alternator as we drove. The battery is old and has been drained many times (which is a no-no for AGM and other lead-acid batteries) so we really wanted to make sure it could keep a charge when we weren’t driving until we can afford to buy a new one. I’m going to make an in-depth post about our solar setup soon so stay tuned for that. We did a lot of research before committing to anything because it is a little pricey but according to our calculations, we’ll break even in 6 weeks since we won’t have to stay at RV Parks anymore for shore power while we’re working. That was our ultimate goal so we’re super pumped to start saving money and are eager to share some awesome products we found and hopefully make the solar installation a little less intimidating. Our other order of business was finally getting our starting issue sorted out once and for all. We’ve had several people look at it and they all stand perplexed stating that there is nothing wrong. As we suspected, it would be a bit of (expensive) trial and error replacing things one at a time and hoping that we fixed it. We had already replaced the battery, the alternator and a few other potential culprits but it seemed to be happening more than ever. We found a great shop in Pinellas Park and decided to replace the starter. 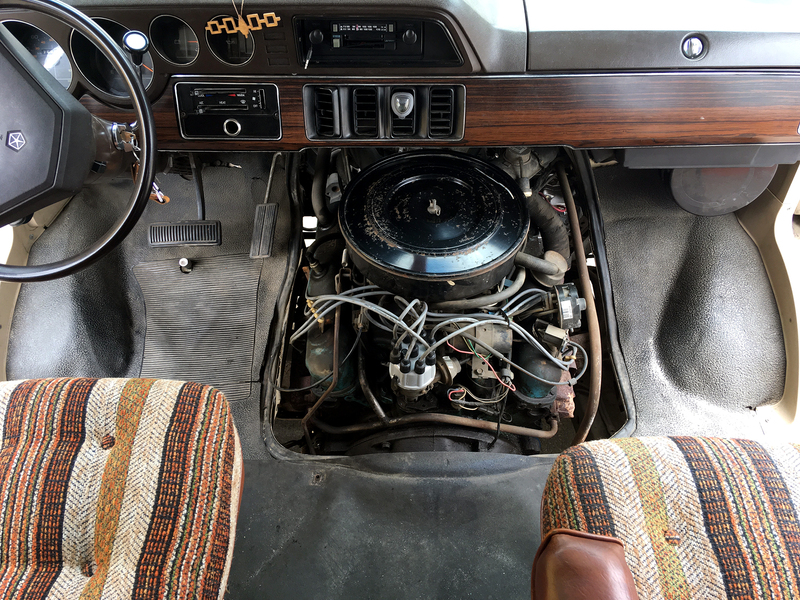 After removing the centre console covering the engine in the cab area, he also said we needed a tune-up ASAP. Turns out that our spark plugs were originals (from 1984…) and he was more shocked that we were ever able to get it started than he was by our original issue. It’s possible that the new spark plugs might have done the trick but we figured we might as well just do the starter too to hopefully prevent it from happening again. Little by little, Clemmie’s getting a lot of shiny new parts under her hood! We are so pleased with how quickly she fires up now and feel pretty confident that we can start to be normal people who can turn their car off multiple times a day. Before, we would strategically plan errands to avoid turning the van off in fear that it wouldn’t start – this upgrade should definitely help with our fuel costs. Relaxing and getting a chance to spend time with family was great BUT we were anxious to hit the road again. As lovely of a view as we had, having a cool new one every morning is unquestionably better. We boogied back northeast, boondocked a night in Orlando and decided to visit America’s oldest city, St. Augustine. 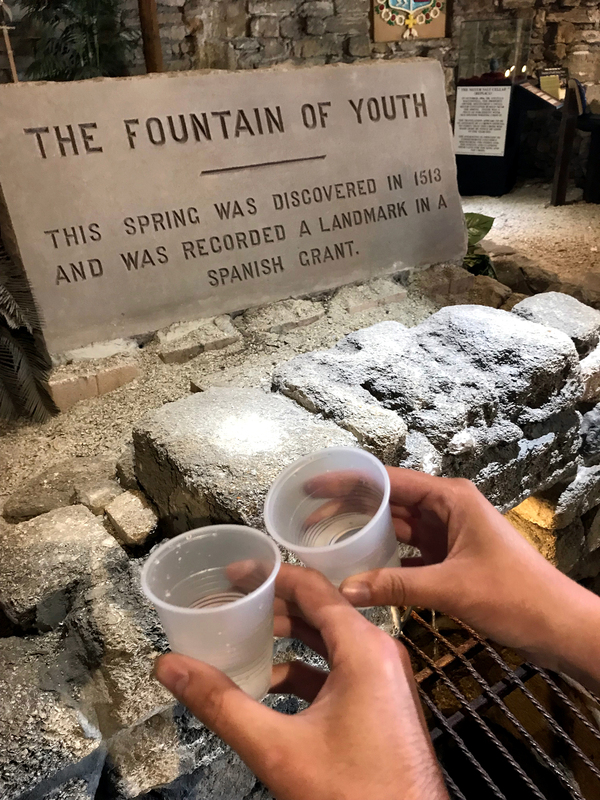 Following Ponce de Léon’s quest, we were in search of the mythical – or not so mythical – Fountain of Youth. I think our journey was a little easier with all the road signs and all, but that’s neither here nor there. They’ve basically turned this zone where the longest continuously inhabited settlement is into an archaeological park centred around a stream of magnesium-heavy water that claims some Tuck Everlasting-like effects. Truthfully, it tasted the way my water bottle does when it’s been sitting too long but who am I to judge. Around the rest of the park, there are blacksmiths clankin’ away, presentations on weaponry & canons and peacocks showing off how beautiful they are. Not sure if it was period consistent but we also had a bite at the BBQ joint at the end of the park and it was way tastier than we would have expected. Cheers to probably aging normally! From there we cruised through Jacksonville Beach and are finally back to crossing state lines and checking out some new scenery. Next stop, Georgia! As a similar vintage Dodge van owner and fulltimer, if it cranks but won't start, it can be the ECM unit. Mine got worse over several years, trying to give the hint that it needed attention. Eventually it totally failed, but replacing it totally solved all of my problems and made it start instantly even if I hadn't moved in a week or more. These old Dodges are among the best vans ever built, solid, reliable, and they drive like a dream. The ECM's are their only potentially hard to identify quirk. I now carry a spare for that just in case insurance. The new one might last another 30 years like the original one, but I'm now prepared in case it doesn't. The ECM doesn't seem to effect the running of the van, only the starting of it.